The fashion industry is highly creative. This creativity, however, sometimes spills over into the realm of the bizarre. Below are some of the fashion industry’s offbeat inventions that have failed to catch on. In its original role, armour was not a fashion accessory: it was a means of preventing injury and death in war. One fashion designer used armour for peaceful purposes, however, and attached shining plates of it to jeans. These plates protected legs during the crush of the journey to and from work but were rather uncomfortable. 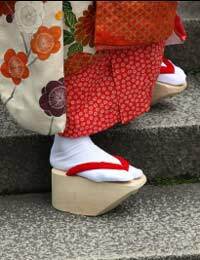 Because many people wear slippers at home, why should they not attach cleaning fabric to the soles and clean as they walk? This was the thought behind a designer’s bright idea. The idea never took off, though. The slippers were hard to walk in and weren’t suitable for carpet cleaning: they worked best on laminate, wood and vinyl. On such shiny surfaces, however, wearers risked slipping and breaking a limb. Expandable trousers are common. The waists have built-in elastic. But a designer felt that from time to time people’s legs might also need more room. Expandable trouser legs didn’t use elastic, though. They had a zip running the length of each leg. When a trouser leg began to feel tight, the wearer could simply pull down the zip and release more fabric. Fashion designers are always on the lookout for places on the human body where they can attach jewellery. It was therefore inevitable that someone would decide to fix jewellery to eyes. A thin wire held the jewellery. The wire itself hung from a contact lens. The designer expected fashion-conscious consumers to wear the lenses and give the impression that jewellery dangled straight from the centre of their eyes. Trousers with built-in knee pads have a functional use in the construction industry. The pads give protection when it’s necessary to kneel to do certain jobs. Knee pads sewn onto the outside of fashion trousers and jeans serve no purpose. They also look clumsy and outlandish. And yet at least one designer has tried to launch a knee pad range of leg wear. It’s common for men and women to wear socks with sandals; but a lot of people object to the sight. A fashion designer came up with a solution: socks that extended from the knee down to the ankle and stopped. Such socks were really just tubes of fabric that covered the lower part of the legs. Feet and toes remained exposed to the elements. Fashion designers have made several attempts over the years to introduce self-supporting umbrellas to the public. These usually come with a hat. A series of wires emerging from the top of the hat support the umbrella. Some designers have tried to add value to these umbrella hats by offering optional accessories. The accessories include suspended ashtrays for smokers. The light bra had a series of implanted lights on its cups. When a suitable occasion arose, the wearer could switch on the lights and treat onlookers to a colourful display.